Why Would You Need a 6-Person Tent? What tools do I need to set up a 6 – person tent? How to clean my tent? What is the best terrain to set up my tent? How durable is my tent? Many campers believe that the size of a 6 – person tent is the best for their family. A 4 – person tent might be small for a nuclear family if they tend to bring a lot of gear and equipment. On the other hand, the 8 – person tent might be too large and heavy to carry around. Therefore, the best 6-person tent would provide a right size for a family of 4 to 5 people- the most common size of the family in America. If you are looking for a tent to buy for the family, take a look at the reason why you need a 6-person tent, its pros, and cons as well as some of the best 6-person tents you can find on the market. Don’t just think that a 6 – person tent is to accommodate six people as its name suggests. If your family consists of 4 to 5 people, you might want to consider a 6 – person tent if you want your family members to feel comfortable inside the tent. Also, if you have a lot of belongings, it would be an ideal option since you obviously have more space to put all of your stuff. And in case you want to invite other friends to go camping with your family, having a 6 – person tent would provide enough room for everyone to feel comfortable. Affordability: First of all, a 6 – person tent is quite affordable, especially if you compare its price with the price of an 8 – person tent or a 10 – person tent. These two latter types of the tent are more expensive and they might provide unnecessary space for you. On the other hand, while 4 – person tent and 5 – person tent might be cheaper, they are not so if you divide the price per head. When you buy a 5 – person tent, you might pay slightly a little bit more for much more space. Space: For a 4 to 5 member family, a 6 – person tent provides a lot of space. And when you have so many rooms, you would be able to use dividers to have some privacy you might need. Portability: Most of the 6 – person tents on the market are quite lightweight and portable, which you can carry around without any difficulty. An 8 – person tent, on the other hand, might be too heavy for you to carry. Variety: Since the 6 – person tent provides sizes which suit most of the families in America, they are certainly popular. 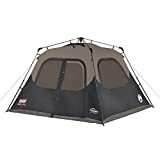 And with their popularity, you can find a lot of different brands that produce 8- person tents with different materials, designs, and features. Whatever you need, you might find a 6- person tent that meets your requirements. The tools you need to set up your 6 – person tent are varied among different brands and models. In most of the cases, all the tools that you need are included in the package when you buy your tent. Along with them are the instructions and guide books which you can use to set up your tent. In case you buy a used 6 – person tent, make sure you ask the sellers about the tools that come with the original package. Just like when you set up the tent, you can find information on how to clean it from the guidebooks that come with the tent when you buy it. In general, you can clean the outer layer of the tent with soapy water. You can also gently rub off dirt with a soft bristled brush. After washing your tent, you should let it dry naturally before folding it and putting it away. You should remember to clean your tent right away when you go back from your trip. If you fail to do, dirt, salt, and other harmful particles will penetrate into the material and degrade the quality of your tent. The best type of ground should be a flat one or even a surface. There are some types of the tent which you can set up on sloppy terrains. However, that would also depend on your skills and experience as well. Make sure that you have a clear ground of at least 8 to 10 feet to set up your tent. Many factors affect the durability of a tent. Higher quality, more premium tent tends to last longer. Also, how you use your tent also affects the time your tent could last. If you clean your tent frequently and maintain it properly, it would last longer. Other factors such as sun rays, rain and the frequent of use might also affect the durability of your tent. Before you start searching for a 6 – person tent, you should list out your needs and preferences. For example, think about how many people you often go camping with and how many items you like to bring with you. You also need to think about the season and types of weather you would like to go camping in. If you often go camping in the summer, think about 3 – season tent. On the other hand, if you often go camping in the winter, the 4 – season tent is a better choice. You should consider reading reviews and feedbacks on the Internet about some of the models of 6- person tent that meets your requirement. Also, you can go in the physical store and see these tents for yourself. Make sure that you know about the size and weight of a product along with its features. Pay attention to the measurements of the outside of the tent as well as the inside. They are hugely different. Only by researching carefully could help you make the most informed choice about what types of 6- person tent you like to buy. It might take you a long time and an enormous amount of money to have a good 6 – person tent. That is why you need to care and maintain it properly to make it last as long as possible. Some elements such as wood limbs or bird droppings might degrade the quality of your tent so make sure you let your tent stay away from them as much as possible. You should clean your tent right after you get back from your trip. And also store it when it is dry. Also, you should never let the poles telescoped together when you store your tent. Even when you set up your tent at your backyard, don’t let it there day by day. You should store it, or at least take it away from the sun. The UV factor from the sun ray would be able to damage the surface of your tent, especially over long exposure. This 6 – person tent is made of 100 % of 150 D polyester. It features the WeatherTec system with patented welded floors and inverted seams. This tent also has an integrated rain fly to provide extra airflow. The poles are pre-attached. This 6 – person instant cabin is huge and spacious that you can even put two queens sized beds into the tent. It has the great waterproof ability with the application of the WeatherTec system and the rain-fly option. The material of this tent is of high quality which makes the tent very lightweight, well ventilated and durable. With the rain fly, the air can circulate even more effectively, making you feel cool most of the time. The poles are pre-attached so that you can easily set it up. In fact, you can instantly set this tent up in less than 5 minutes. The zipper on the door is very stiff. There are only two – storage pockets for you to put your belongings. Verdict: If you are looking for a – 6 person tent with huge space, you can consider this option. With its ease of use, it is suitable for new campers. It is also a great choice to use in the rainy or hot summer nights. This tent is made of 100 % of polyester with the size of 96 x 120 x 72˝. The weight of this tent is 14 lb. 12 oz. It features the freestanding design and dome type with taped seams on floors and rain fly. It also comes with mesh wall panels and clip and pole sleeve construction. With the design of the freestanding one, you can easily set up this tent in many different locations and terrains. You can even set it up in a sloping one. The polyester made in this tent is of high quality and promises to stand well against many harmful factors such as UV rays. It also makes the tent very lightweight, allowing you to carry the tent around without feeling any burden. There are a lot of pockets around the tent for you to store your personal belongings. The zippers are so smooth that they don’t make any noise at all when you pull them. The rain fly is quite short. Verdict: It is a great 6 – person tent for the summer when the weather is nice and sunny. With a lot of space and storage bags, you can consider this option when you have a lot of personal items to bring with you when you go camping. This 6 – person tent is made of 100 % of cotton duck canvas. It is 6’6″ high in the ceiling. It features two large D-shaped doors (front and back), four large windows. Besides, it has #10 YKK zippers and two funnel-flow vents. The floor is made of 16-ounce polyester-reinforced vinyl with welded seams. The canvas material is of high quality as it is very durable and also very breathable thanks to the Hydra-shield component. The construction of this tent is very sturdy and firm, which can help the tent to stand in case of a sudden downpour. Not to mention that it is very easy to set up the tent. You can do it alone in about 10 to 15 minutes. Also, this tent is very spacious and provides good headroom for you to stand and walk around easily. This 6 – person tent is a little bit heavier than other types of 6 – person tents on the market. Verdict: This tent is the best option for a family to go camping in the summer as well as winter. It is also one of the best choices if you often go camping in the rainy season. It is suitable for both new and experienced campers. With its growing popularity, there are many models of 6 – person tents on the market with different colors, designs, and materials for you to choose from. All it takes a little bit of time and energy before you can find a product that meets all of your requirements. I hope that with all of the information above, you would be able to find the best 6-person tent on the market and hence, have a lot of good time camping in the future.